This past weekend I kept things a little more low-key than I did the weekend before. Saturday was the leisurely day I intended it to be, but I ended up making my most expensive Starbucks trip to date. I left to get my Chai latte and returned with an empty cup and a few more items than I expected to bring back home. As I enjoyed my beverage, I stopped to peruse the items at a moving sale that was situated in a rather unusual location. The house was nestled in between a fast food restaurant and an equipment rental establishment and while it was a bit random, they seemed to have a TON of stuff. They may have been borderline hoarders. The cabinets and potential for additional storage were what initially drew me in, but I left without a single organizational option and instead picked up a few small items and a painting by an artist I know nothing about. This isn't the first time I've invested in artwork, but this piece is considerably larger than the last one I acquired. The seemingly French setting of the painting captured my attention immediately, but it was the wooden frame which really solidified the deal for me. 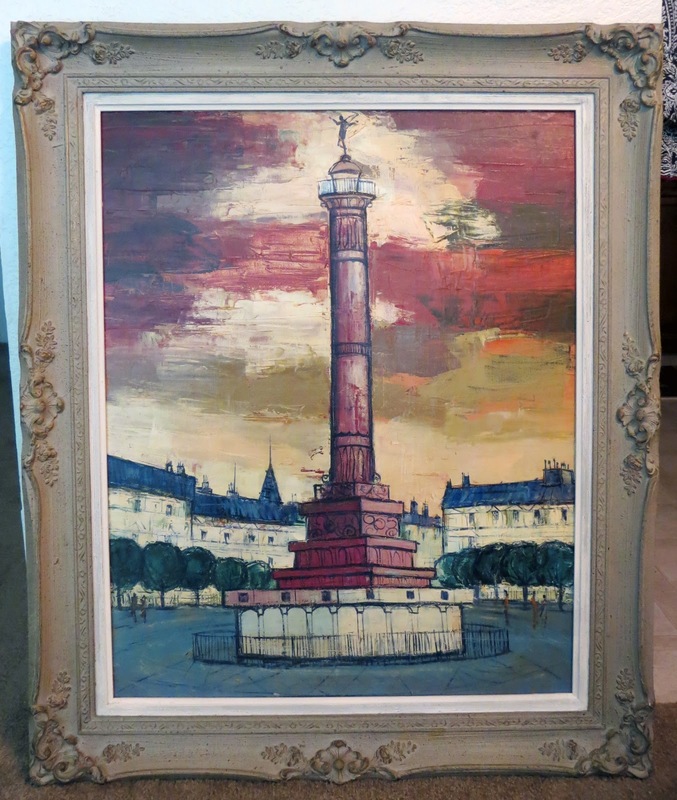 The focal point of the painting is clearly the pillar with a small undefined statue figure on top and it instantly reminded me of Paris and the Place de la Bastille where you can find the Colonne de Juillet and Dumont's Génie de la Liberté. The man who was selling it didn't know anything about where it came from originally. He had bought it from an estate sale, so his only information was that it was an old painting, a conclusion I had already reached on my own. So I began to do some research when I got home. The artist's name proved to be unhelpful in determining the history of the piece, but I'm not too concerned. I wasn't expecting this to be particularly valuable, but it did evoke a feeling of nostalgia from my trip to Paris some years ago. I've looked at photos of the column and statue next to the painting and while I clearly see some differences, there is a distinct resemblance to the column and sculpture I originally reflected upon. 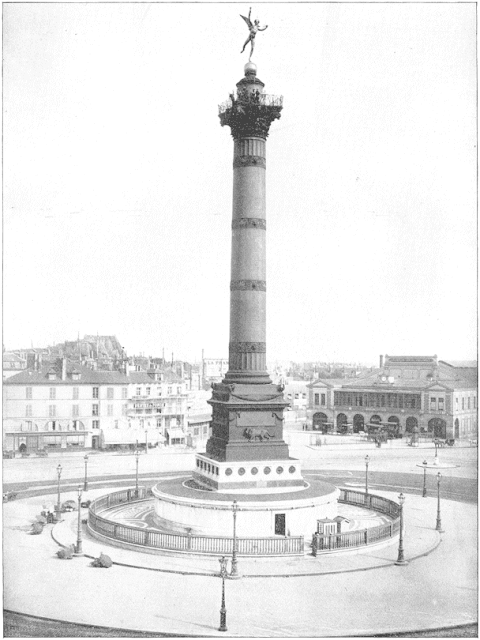 I briefly considered it to be a rendition of the same sculptor's version of Napoleon on the Vendome column, but quickly dismissed it because the pillar was not segmented in the same way and Napoleon isn't standing on one leg, nor does he have wings. I feel it's pretty safe to say that my original assumption is correct. I will continue to do research on the painting in hopes of finding more information about the artist, but in the meantime I'll be enjoying its presence in my home.